Physical description:Body length up to 45 cm/17.5 in. 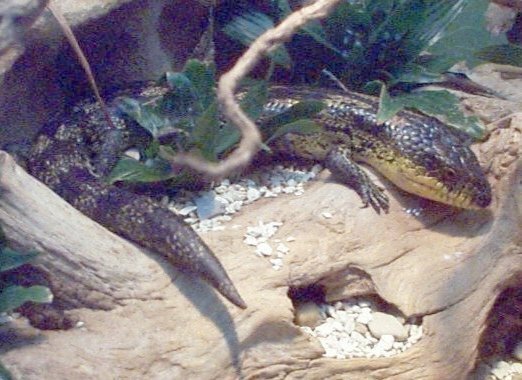 Skinks have a stout body with relatively small limbs and a thick, short tail. Broad, blunt triangular head and scales that are usually smooth and contain small plates of bone. Deep, berry blue tongue vividly offsets against the deep pink interior of the mouth. 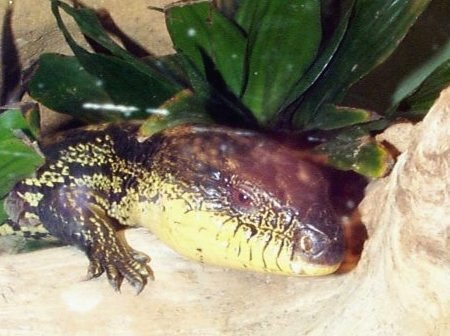 Skinks usually are solitary animals, living secretive lives until mating season. They are only active during the warmer months. Mating occurs in November or December. Females only reproduce every second year and give birth to an average of six live young. The animal expands its ribcage and turns side on in order to appear larger. At the same time, it opens its mouth wide to hiss and display its startling blue tongue and pink mouth. If you have any additional infomation to add to this site, mail me at tastee @ mailexcite.com. Frank, Norman, et.al. "A complete guide to scientific and common names of reptiles and amphibians of the world." Reptile & Amphibian Magazine. (Pottsville, PA: N G Pub, 1995) 196.